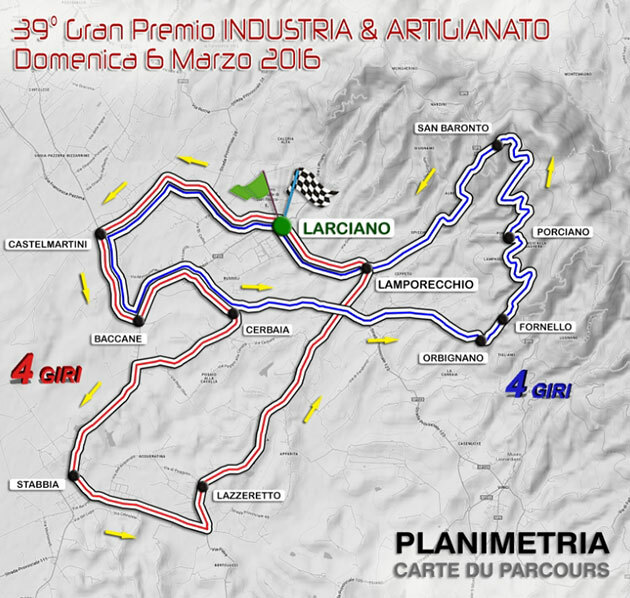 The Race: This is a tough day of racing in Tuscany's hills. 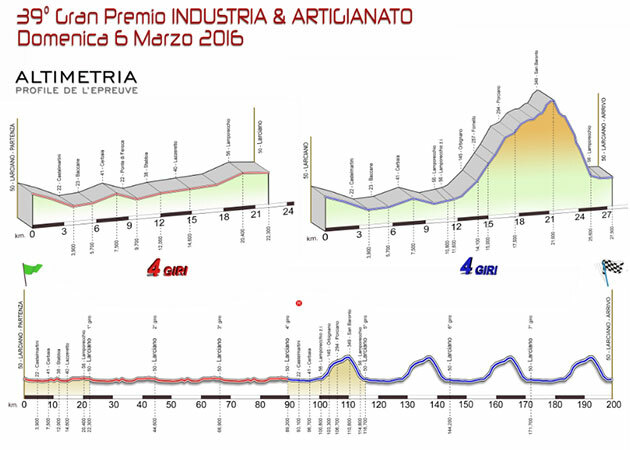 A look at the race profile will disabuse anyone of the notion that a rider can sit in and sprint at the finish. 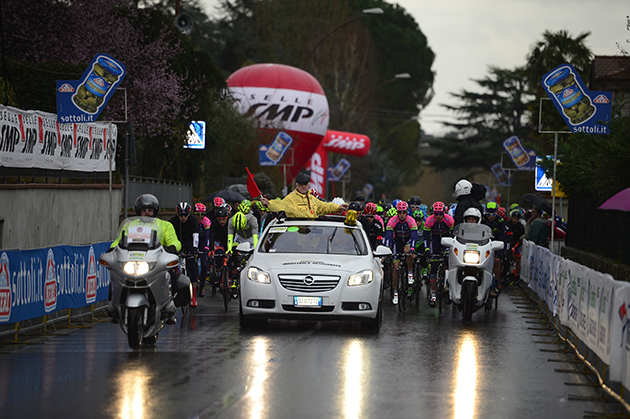 To make things still tougher, it was a cold, wet day, as the rider photos make clear. 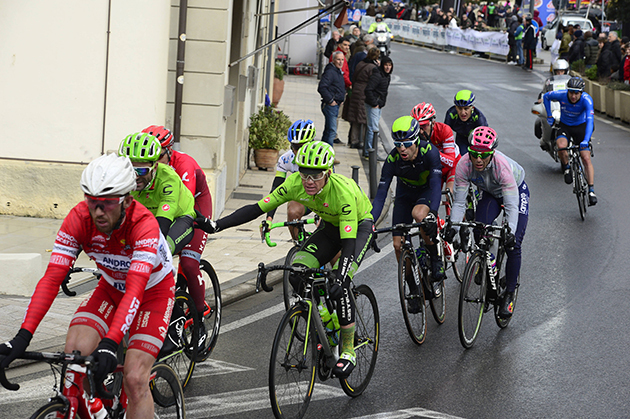 A break went early but during the race's final circuits, some dropped riders made it up to the front group. 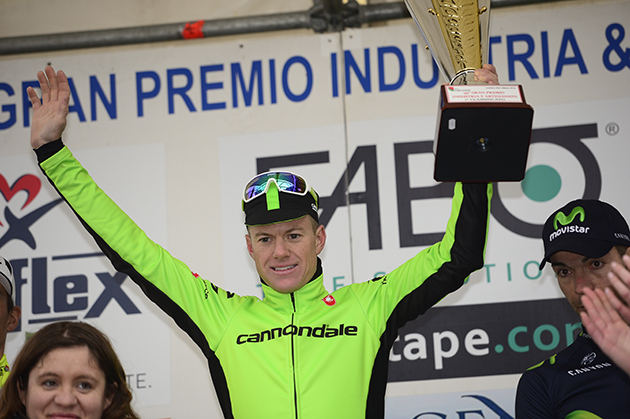 Among them was Cannondale's Simon Clarke. 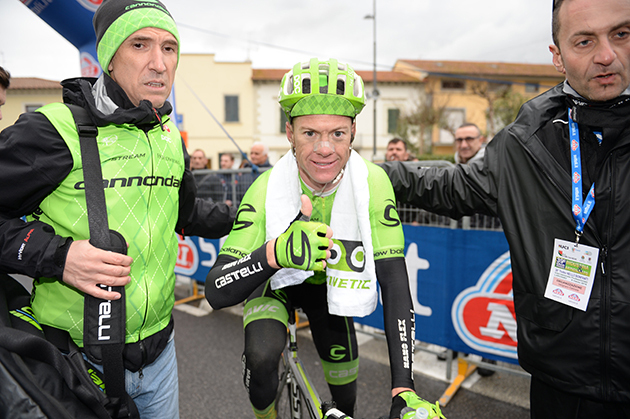 Clark was on form today and near the end he blasted clear of the other leaders and big-geared to the finish in Larciano to win by more than a half-minute. 3 Giovanni Visconti Movistar s.t. 4 Rigoberto Urán Cannondale s.t. 6 Ramunas Navardauskas Cannondale s.t. 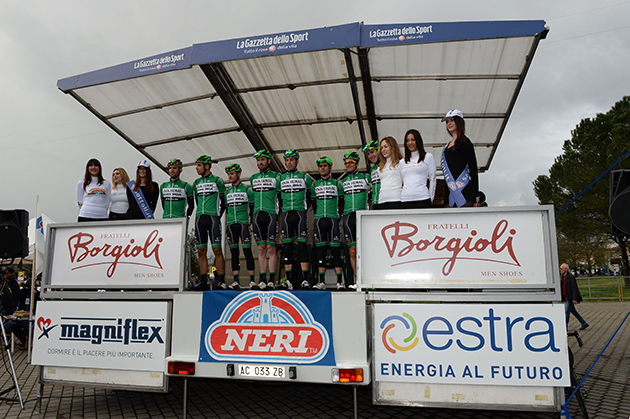 7 Cesare Benedetti Bora-Argon 18 s.t. 8 Mauro Finetto Italy s.t. 9 Sergio Pardilla Caja Rural s.t. 10 Simone Petilli Lampre Merida s.t. 11 Adam Yates Orica-GreenEdge s.t. 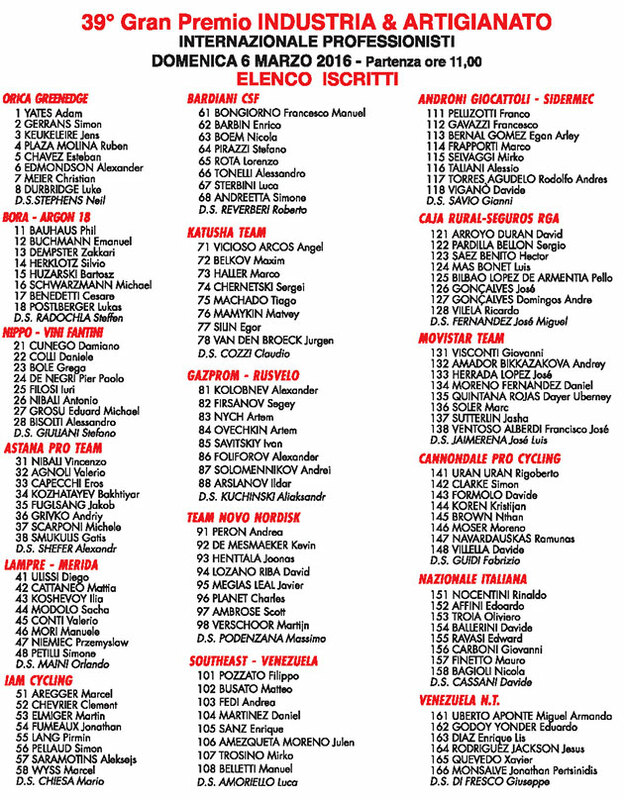 12 Egan Bernal Androni Giocattoli s.t. 16 Nathan Brown Cannondale s.t. 18 Sergey Chernetsky Katusha s.t. 19 Pello Bilbao Caja Rural s.t. 20 Franco Pellizotti Androni Giocattoli s.t. 21 Jonathan Fumeaux IAM Cycling s.t. 22 Tiago Machado Katusha s.t. 24 Valerio Agnoli Astana s.t. 25 Rodolfo Torres Androni Giocattoli s.t. 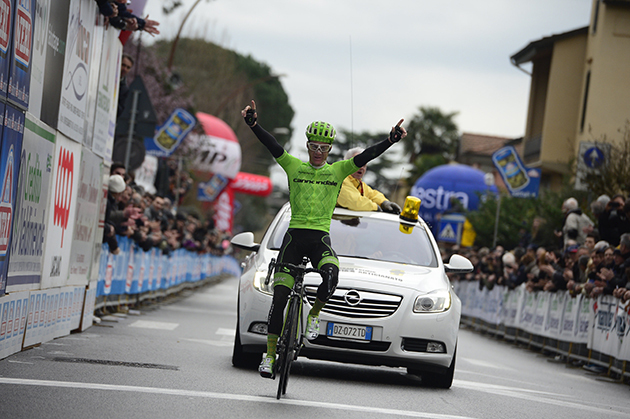 27 Stefano Pirazzi Bardiani CSF s.t. 28 Jaime Rosón Caja Rural s.t. 30 Manuel Belletti Southeast-Venezuela s.t. 31 Nicola Bagioli Italy s.t. 35 Pirmin Lang IAM Cycling s.t. 38 Davide Ballerini Italy s.t. 43 Yonder Godoy Venezuela s.t. 44 Xavier Quevedo Venezuela s.t. 45 Lorenzo Rota Bardiani CSF s.t. 46 Joonas Henttala Novo Nordisk s.t. 47 Alessio Taliani Androni Giocattoli s.t. 48 Ildar Arslanov Gazprom-Rusvelo s.t. 49 Charles Planet Novo Nordisk s.t. 50 Silvio Herklotz Bora-Argon 18 s.t. 51 Kevin Demesmaeker Novo Nordisk s.t. 52 Ivan Savitsky Gazprom-Rusvelo s.t. 53 Artem Nych Gazprom-Rusvelo s.t. 54 Matvei Mamykin Katusha s.t. 55 Marcel Aregger IAM Cycling s.t. 56 Martin Elmiger IAM Cycling s.t. 57 Marcel Wyss IAM Cycling s.t. 58 Clément Chevrier IAM Cycling s.t. 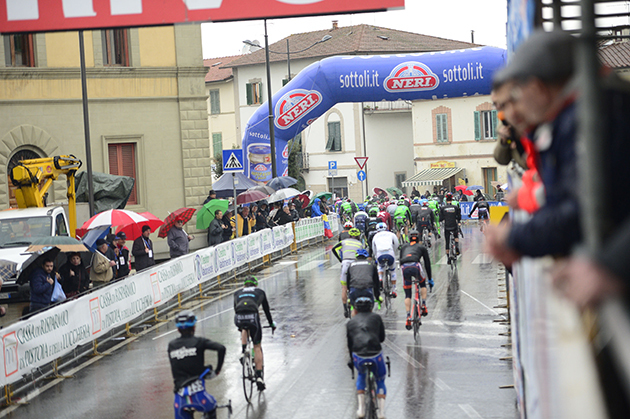 59 Alessandro Bisolti Nippo-Vini Fantini s.t. 60 Lukas Pöstlberger Bora-Argon 18 s.t. 61 Antonio Nibali Nippo-Vini Fantini s.t. 62 Iuri Filosi Nippo-Vini Fantini s.t. 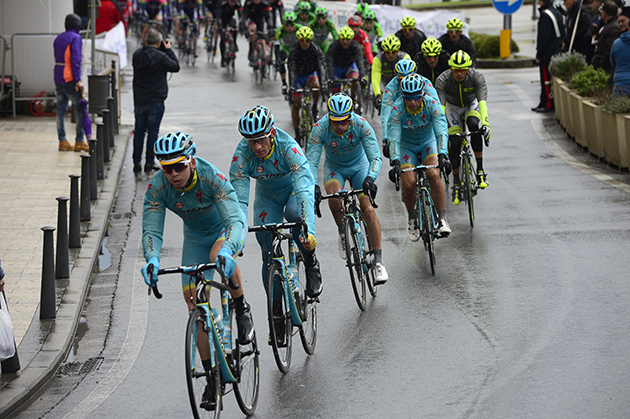 63 Jakob Fuglsang Astana s.t. 64 Bartosz Huzarski Bora-Argon 18 s.t. 65 Kristjan Koren Cannondale s.t. 66 Oliviero Troia Italy s.t. 67 Alessandro Tonelli Bardiani CSF s.t. 68 Sergey Firsanov Gazprom-Rusvelo s.t. 69 Artem Ovechkin Gazprom-Rusvelo s.t. 70 Jorge Arcas Movistar s.t. 71 Dáyer Quintana Movistar s.t. 72 Antonio Pedrero Movistar s.t. 73 Filippo Pozzato Southeast-Venezuela s.t. It's time to race and the streets are already wet. 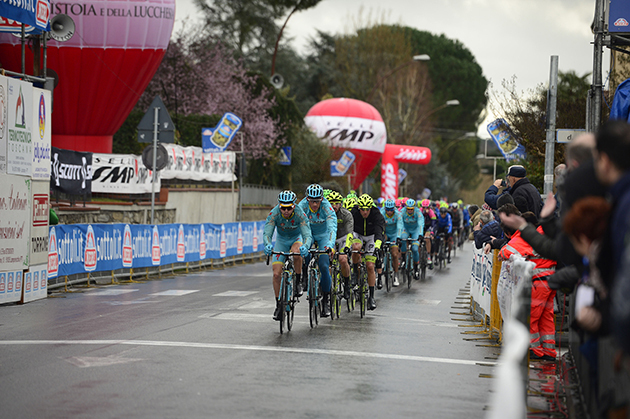 Astana clearly invested a lot of energy into this race, but their best placing today was Valerio Agnoli's 24th. 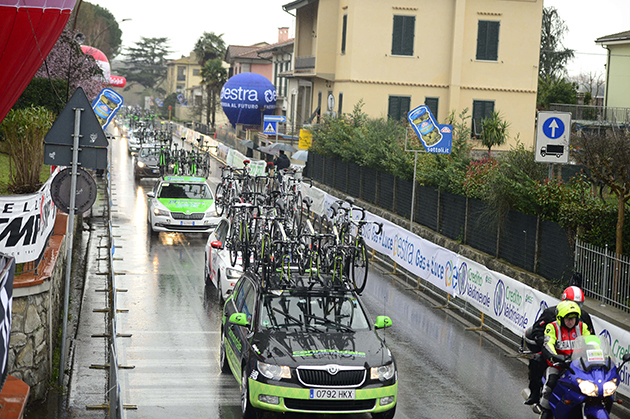 The team cars follow the pack. 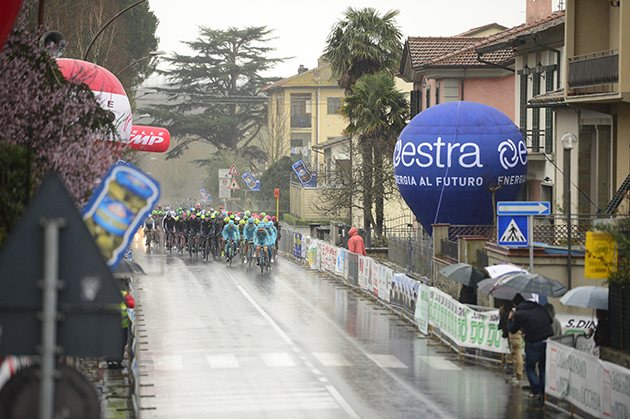 Astana still at the front. Simon Clarke is well-positioned late in the race. Simon Clarke wins the race. Clarke is well-pleased with how the day turned out. Clarke gets to enjoy his win. 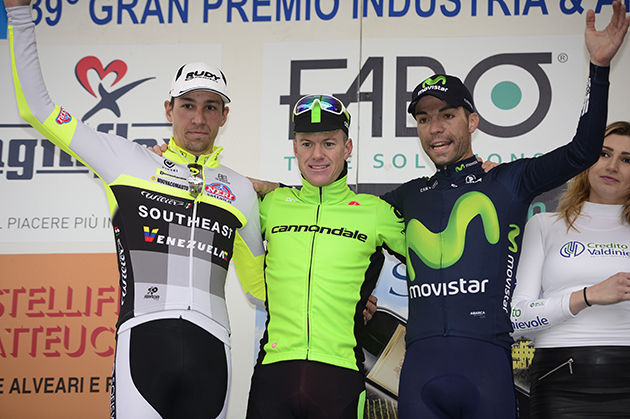 The podium, from left: Andrea Fedi (second place), Simon Clarke, and Giovanni Visconti (3rd).